As you can see, the outline of the decks is nearly the same. 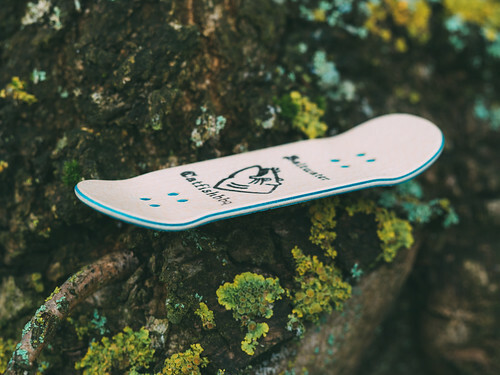 The nose of the decks is flat on the top and the tail is a classic round tail. And look at these perfect drilled holes. 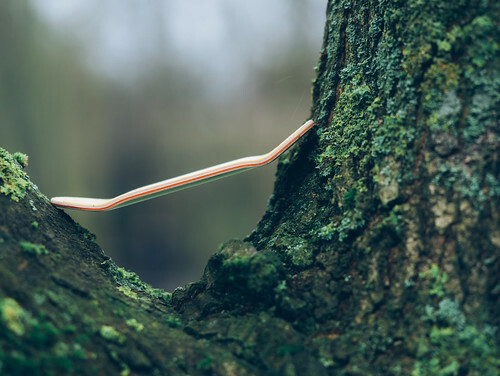 You won´t see perfect drilled holes like this even in the teen p*rn section! The saltwater mold is about 33mm x 97.25mm. The freshwater mold is about 33mm x 97.25mm. As you can see the saltwater shape is more like the low to medium shape and the freshwater shape is more like medium to high. The concave on both molds is well defined and got a really fluid transition into the kicks – doesn´t mater if fresh or salt! The decks are both 33mm wide and IN SHAPE like Heidi two weeks after giving birth! Hopefully this was a litte help for you guys if you think about a Catfishbbq deck as your next setup. 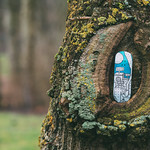 I think the pictures are good enough to check it out by yourself. Shapes are like science and soccer, everybody got an opinion. So choose what you like and have fun while shredding! 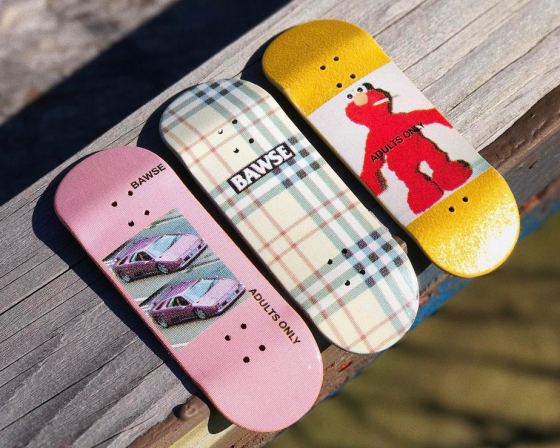 Catfishbbq decks are rare and some decks are in stock now. So be quick and get one right over here: Click! Finga – Splitply Decks In Stock! I told you allready yesterday, that California knows how to party! Have you seen the Oscars last night? Well, I think this was a big party!? This deck was pressed in the freshwater mold. Within the next days I will show you a comparison between both Catfishbbq shapes. This deck is the Aaron Yant pro deck. 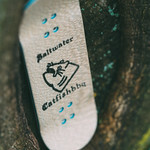 It´s fully printed with a genuine Catfishbbq realwear graphic. These skateboard heat transfer graphics are able to ensure the most realistic, consistent wear on the market. 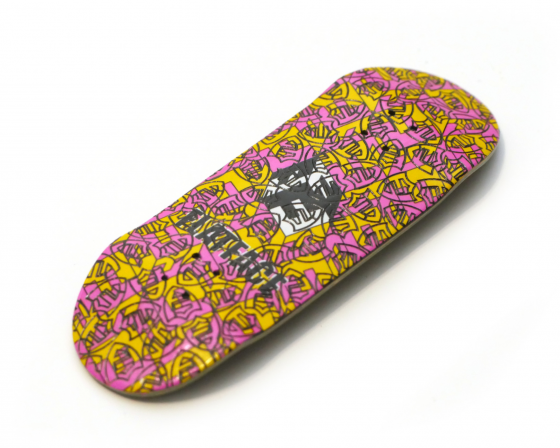 Besides the artwork and the shape, this deck is a highlight just because of the workmanship. 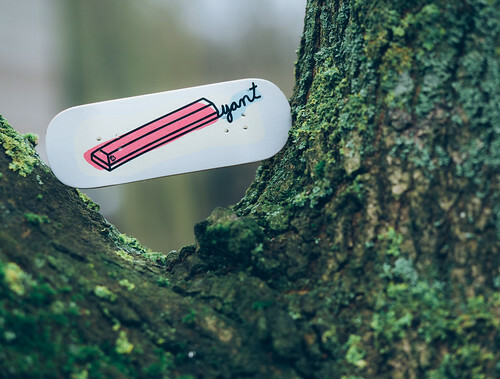 The shape and cut of the deck is something special, it fits perfect to the wooden/printed graphic and it got a wide nose like the mouth of a catfish. Good job! Vlad, the owner of Catfishbbq, puts not only a lot of effort in his fingerboarding products, he´s got an awesome fingerboarding team. Every rider of the team got his own pro graphic and gets 5$ for a sold deck! 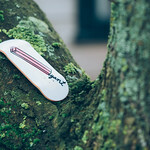 Each signature “Show and Tell” deck features a little personal something from each of the team riders. 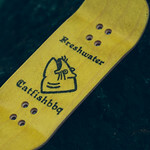 $5 from each sale goes back to the corresponding team rider, so pick up a deck and support the Catfishbbq team. Thats awesome! 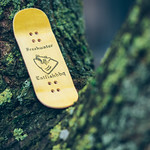 I haven´t heard such a deal on fingerboard companies before and I really like this fact! 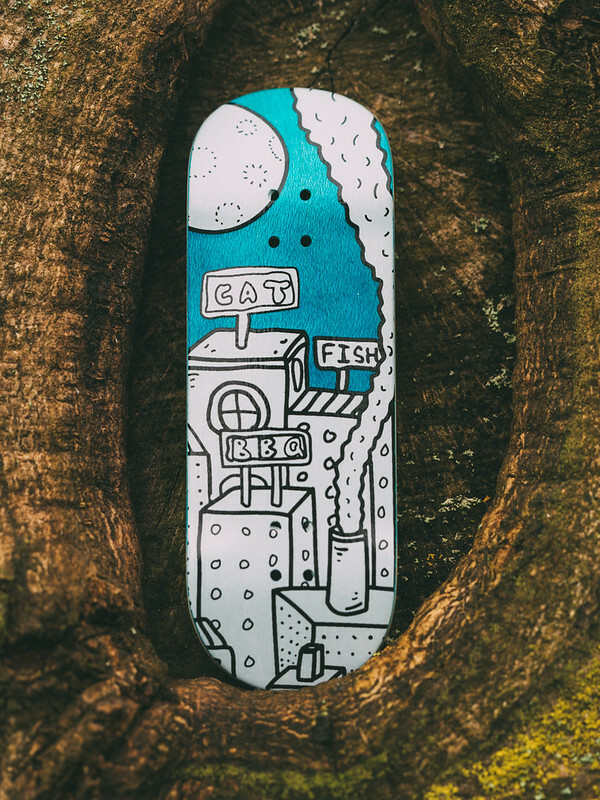 This deck is available at the Catfishbbq store right here: Click! 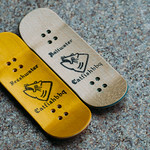 At the moment there are a few decks left at the Catfishbbq store. 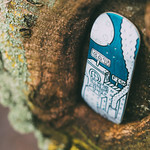 You better be quick to get one of these of the actual stock! CLICK! And don´t forget there is a 10% coupon code till march on the website at the moment!!! You should check out @catfishbbq on instagram! There are some really cool decks and always the latest stock announcements! @catfishbbq @catfishbbq @catfishbbq !!!! California…knows how to party —> I´ve been to the US in 2015 for the Race Across America and, no hate to the other states, but I think Cali is my fav for sure. So I´m glad to tell you the the story about this letter…. 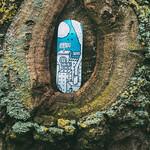 Two weeks ago – yes, two weeks = shame on me – I allready received a letter from San Francisco, California. It´s not that often I´m getting a letter from the USA and this one was special for sure. The package contains two CATFISHBBQ decks! Ya heard right! Hype hype hype!!!! 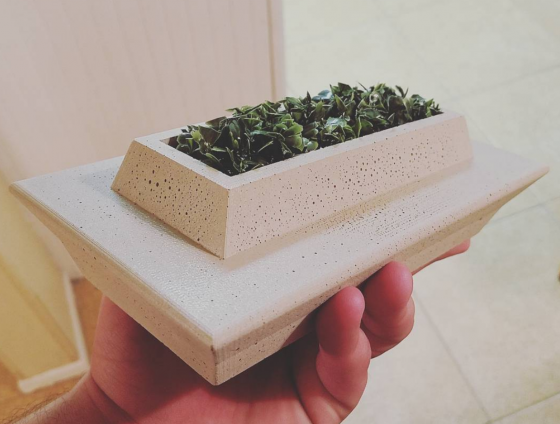 This deck was pressed in the saltwater mold. 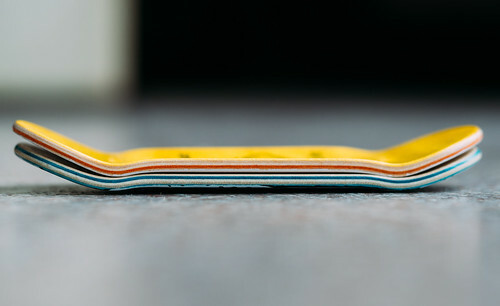 Within the next days I will show you the next deck straight out the freshwater mold and I will do a comparison for you. This deck is not the kind of wood you will put in your fire on your next bbq! 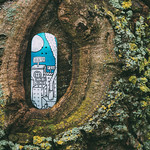 The jungle graphic deck is a realwear graphic deck. I really like the fact that the graphic consits of the bottom ply and the printed graphic. 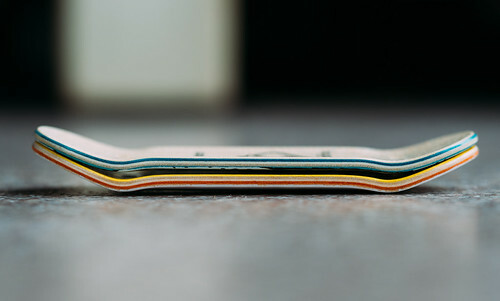 Each deck features a different bottom ply = you always got a really cool one of a kind colorway. This deck is exactly what you need for the venture of the concrete jungle. 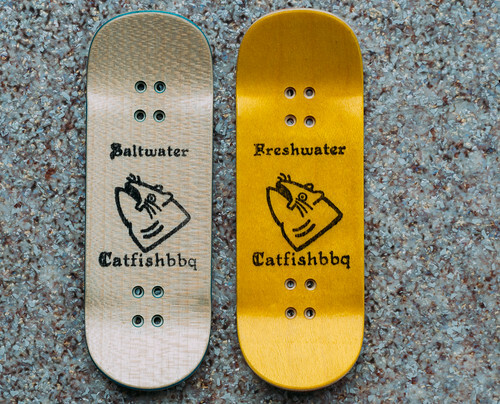 Catfishbbq decks are made with genuine skateboard heat transfer graphics to ensure the most realistic, consistent wear on the market. Besides the artwork and the shape, this deck is a highlight just because of the workmanship. 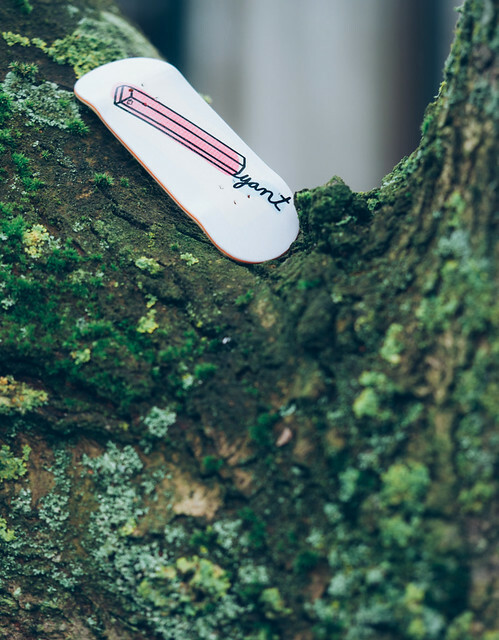 The shape and cut of the deck is something special, it fits perfect to the wooden/printed graphic and it got a wide nose like the mouth of a catfish. Good job! 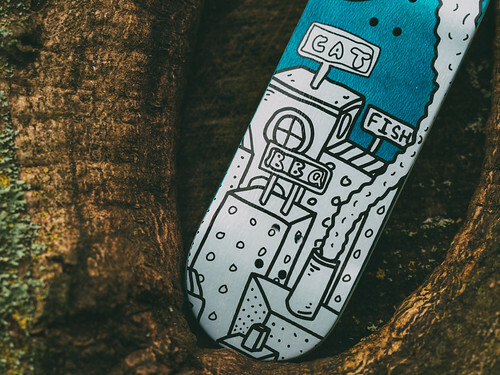 At the moment there are a few decks left at the Catfishbbq store. You better be quick to get one of these of the actual stock! CLICK! Don´t forget there is a 10% coupon code till march on the website at the moment!!! 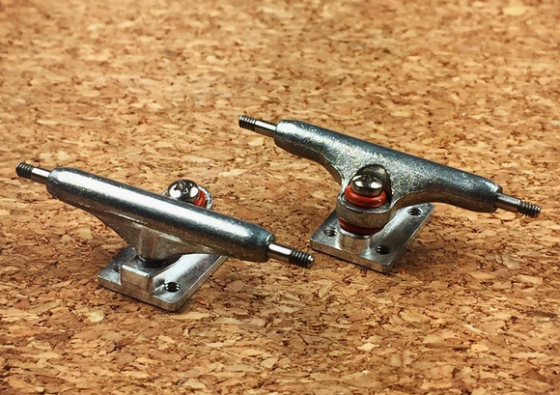 Dynamic Trucks @ FBS – TODAY!